Let's say I have a list variable datalist storing 10,000 string entities. The QTableView needs to display only some of these entities. That's is why QTableView was assigned QSortFilterProxyModel that does all the filtering. After all Proxy work is completed the QTableView "receives" 25 entities to display (so remaining 9,975 entities were "filtered out". Now, I create a QLineEdit to be used as a search field where the user can type a keyword to narrow down the list of the displayed 25 entities (items) even further. For this purpose I link QLineEdit's textChanged signal to assigned to QTableView Proxy's filterAcceptsRow() method. The problem I see here is that Proxy model needs to get back to the original 10,000 entities long list to re-filter once again. And again. And again. I wonder if it is possible to create a second Proxy that would pickup what the first Proxy has already filtered out: 25 entities instead of 10,000.
datalist is 10,000 entities long list variable. QSortFilterProxyModel is a second Proxy Model working on a pre-filtered by first Proxy data (it is used to filter by the user's keyword). 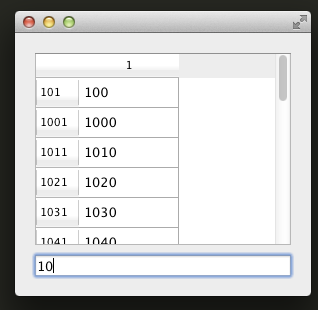 QTableView is a QTableView itself used to display the entity items. So, the question is: is it a valid idea?